This is a picture of my shoulder. My sister and mother came over today so the kids could play under the sprinkler. I sat in the sun, for about 30 minutes, then headed for the shade. 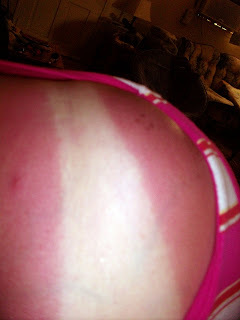 I was in and out of the sun all afternoon, and this is what I am left with. I know I should have put some sunscreen on, but I honestly didn't think I was burning. I am feeling better, girlie wise...still have my little friend, but not cramping nearly as bed. I also slept pretty good last night so I'm not so tired today. I haven't done much of anything the past few days, so this week I will be trying to get my house back in order. Junior starts his new position next week, so it will be good to get in a routine with that. Yikes that looks sore!! Water and vinegar mix help, also aloe. Take care! You are SO BAD!!! NONOBADGIRL!!! Aloe Vera, 100% Gel!! NOW!! Get it at the pharmacy!!! Got something for the pain?? Slather the aloe on it. OMG!!! please watch youself. you can get so sick from sun burn!! OMG that looks so painful!! !